One of the many things that make SECockpit such a unique keyword research tool is that it instantly parses the top ten listed websites for every keyword it returns and does a deep competition analysis on all of those pages. Since we display data a bit differently from other keyword tools and especially since we use a different data-source than most, the competition evaluation can take a bit of getting used to. One of our customers made a brilliant suggestion, that I immediately wanted to take him up on: Show some real-world examples of keywords that you are ranking for and their corresponding competition data in SECockpit. This is a keyword for an affiliate product where the number one spot is taken by the product’s own homepage. As you can see, it has by far the greatest amount of backlinks and it would be quite difficult to knock off of the first spot. However, getting into second place was not too difficult. It did require a link-building effort, but it wasn’t a particularly hard struggle. What’s notable here is that most of the sites in the top results have low-ish domain authority, which always makes things easier. At the same time, most of the top pages are ranking there because someone is actively building links, as indicated by the backlink numbers and also mozRank, to some extent. 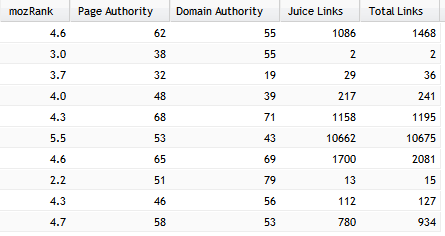 Finally, a good indication that this would be a good keyword to go for is that fact that the lowest few entries are quite weak, with little to no juice links and low authority values. Here’s an example of a semi-easy keyword and a situation you’ll find quite often in the SERP. 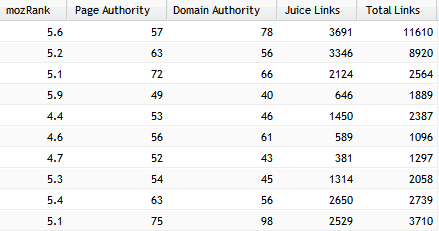 If you look at the Domain Authority column, you can tell that there are a few authority sites ranked on the front page (one of them is Wikipedia, for example). 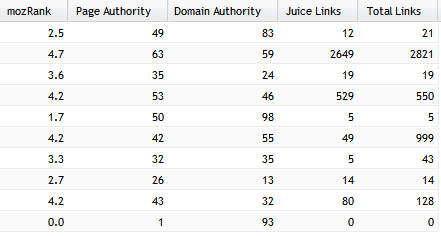 However, the individual pages don’t have enormous amounts of backlinks to them, so they’re probably ranking because of the domain’s authority and because Google doesn’t have anything better to show. You can see that there are several pages with extremely low mozRank and next to no backlinks listed and as expected, it wasn’t particularly difficult to get onto the front page for this keyword. The top three spots are a good bit stronger than all the other entries and from the data, I’d expect it to be tough to get from number 4 to number 1 (tough but possible). This assumption proved to be correct and the page from my site is currently in the number 2 spot and has been stuck there for a while. Here’s a good example of an easy keyword. If you see data like this and the keyword is specific enough and gets a good amount of searches, go for it! First indication: There are two authority sites listed, the one in #10 is an article on Ezinearticles (very good sign that it’s an easy keyword) and the one in #5 is a YouTube video. Note that minimal or no backlinking was done for either. Right off the bat, you could move in here and replace that article and the video with your own, by posting them to the respective sites and building a few good backlinks to them. Next, you can look all across the data and see that there’s only one reasonably strong site ranked in the top ten (#2). 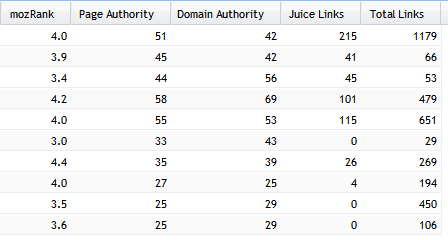 Authority numbers are almos all below 60, most pages barely have a handful of links to them and mozRank scores are all below 5. Here’s an example of a data-set that might seem very strange at first glance, particularly because it looks like the strongest sites are sitting in the middle, instead of at the top. This is, by the way, quite a competitive keyword. It’s one that can be conquered, though, because the competition are other affiliate marketers, not large corporations and/or authority sites. I also want to add that my page held top rankings for this keyword for a long time, but has been doing another Google dance recently. I don’t doubt that it will settle down back in the top spots, though. Okay, now let’s look at why these results are so strange. Closer examination of the top results shows that the number one spot is taken by the product’s homepage and the surprisingly weak number two spot is a second listing (indented listing/double listing) of another page on that same site. Spots number four and five are taken by exact-match domain sites. Yes, Google is still giving significant bumps to EMDs, in some cases. I did outrank both of them with my non-EMD, however (before the recent dance). Next in line are non-EMD sites that have been aggressively link-building to get their spots. 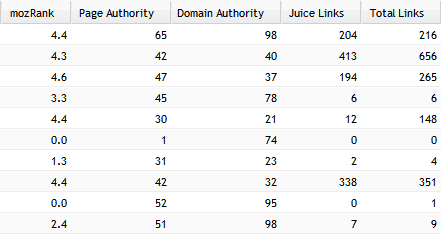 Closer examination shows that the person in charge of the page ranking #6 (based on the metrics, this is the strongest site), is over-doing the on-page SEO an is probably being pushed down because of borderline keyword-stuffing. Overall, you can look at this data and all the exceptions and tell that there is competition going on for it, and this is not an example of “easy pickings”, although it’s still a keyword you can conquer, if you have a good link building strategy and solid on page SEO. To top things off, here’s an anti-example – an example of a keyword that you’re better off not competing for. This is probably the toughest keyword that I am currently competing to rank for and my page is not yet listed in the top ten results (very slowly getting there, though). There are many indications that this is a tough keyword, the main one being the backlink counts. As you can see, every single page listed here has hundreds or even thousands of backlinks going to it. This is a bad sign. If there are a couple of pages with many backlinks listed, that’s not necessarily something to worry about, but when every single spot is occupied by a heavily backlinked page, you’re in for a fight. Another indication is that all of the top listed pages have a mozRank of higher than 4. Again, some pages with high mozRank are nothing to worry about, it’s the fact that they all have 4+ and 5+ mozRank that indicates how tough this keyword is. The same applies to the authority values. Those are some real-world examples of keywords that I’m currently ranking for and I hope that they help you make the best of the data provided in SECockpit. If you have any further questions or comments, please let us know!